For the digital signature example project there is a class called DigialSignature. The first method in this class is AssignNewKey. 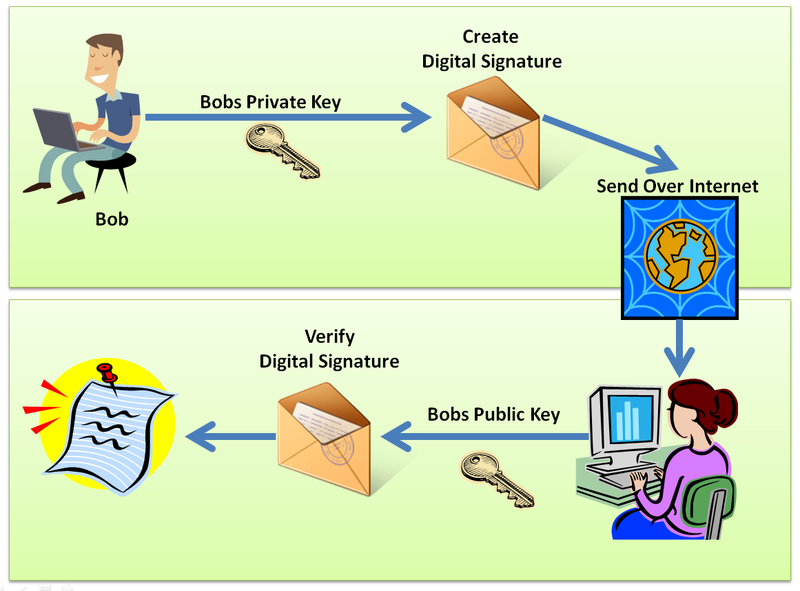 This method will generate a public and private key pair to be used for creating and verifying the digital signature. Next there is the SignData method. This is the method that will create a digital signature. Let’s say you want to sign some data that represents a document, although what you are signing doesn’t matter as it is represented as a byte array. You don’t sign the actual data itself; you sign a hash of the data. The SignData method takes a byte array which is the hash of the data you wish to sign. The first thing that happens in this method is an instance of the RSACryptoServiceProvider class is created and the already created private key (from the AssignNewKey method) is loaded into that instance. Then an instance of RSAPKCS1SignatureFormatter is created and the instance of RSACryptoServiceProvider is passed in. Next the hash algorithm has to be set on the RSAPKCS1SignatureFormatter instance. The algorithm set here has to match the hash algorithm you used to hash your data before creating the digital signature. 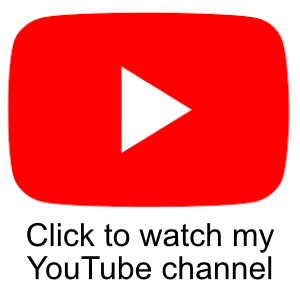 For example, if you hash your data with SHA1 then the string passed into SetHashAlgorithm needs to be “SHA1”, if you used SHA256 (which this example program does), then you need to pass “SHA256” into SetHashAlgorithm. Once this has been done, the last thing to do is call CreateSignature on the RSAPKCS1SignatureFormatter instance. This will return a byte array containing your digital signature. The next method in the DigitalSignature class is the VerifySignature method. This method is used to verify that a digital signature is valid for a particular hash of the data you want to verify. The VerifySignature method takes 2 parameters, a byte array containing a hash of the data that the signature was originally created for, and a byte array of the digital signature itself. First an instance of the RSACryptoServiceProvider class is created. Then the public key that was generated with the AssignNewKey method is imported into the rsa instance. Then an instance of the RSAPKCS1SignatureDeformatter is created and the hash algorithm is set to “SHA256”. Then to verify the signature you called VeryifySignature on the RSAPKCS1SignatureDeformatter instance but providing the hashed of the data that was signed and the actual signature itself. If the signature is valid, true is returned, and false if the signature is not valid. Usage of this class is demonstrated in the following code block. 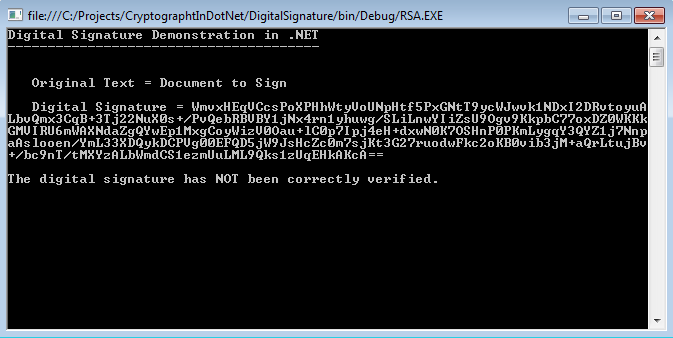 When this program is executed and a valid digital signature is verified you will see the following output. To prove that the VerifySignature method will return false for an invalid signature, you can deliberately tamper with the signature in the debugger by changing one of the values in the debugger, as shown in the following screenshot. When the program is allowed to carry on executing with the tampered digital signature, you will see the following output. How can we make fixed private key and a fixed public key to be used every time rather than generating new keys each time we signed a text ?? Use openssl to generate them. how to write verified signature in pdf. Thank you for the post, it is very useful.. I have a question , If I want to use OpennSSL how to call the private and public key? You can use Open SSL to generate a self signed PFX certificate that contains the public and private key which can then be loaded into your certificate container. 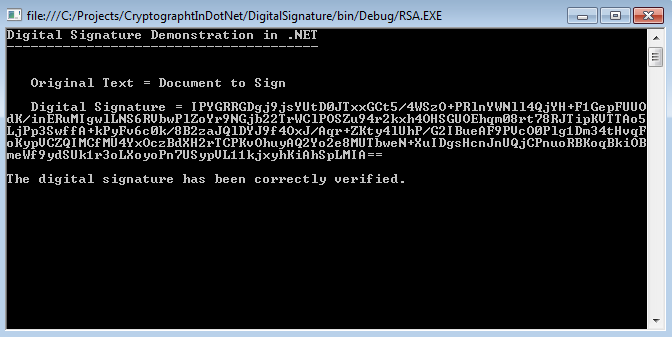 Then you can read those certs and use with RSA and digital signatures in .NET. Here is some sample code for using certs with RSA in .NET. I should really turn this into another blog article.